I was somewhat distressed yesterday when I realized that, with the absence of Brad Setser, I would have to do my own analysis of the trade data – data Brad taught me how to analyze over a decade ago. I may be a little rusty. The good news in the data was the widely touted revival of global trade, an indication of economic healing. 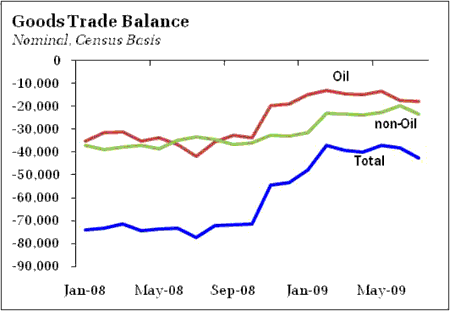 The bad news in the data was the return of an old enemy, a pattern of unbalanced trade. To be sure, I would not focus too intently on a single data point, but the July numbers raise the possibility that the external sector will weigh on US GDP growth in the third quarter. That, of course, is the price to be paid for attempting to revive growth via household spending as a portion of that spending flows overseas in the form of increased imports. On net, the real goods deficit increased 8.5% compared to June to $38,811. Moreover, the July figure compares to a second quarter average of $38,500. If this trend continues, trade will likely be a net drag on growth, something of a disappointment for those looking for continued rebalancing to help support the US economy. Again, a single data point does not make a trend. Indeed, it is a trend that should not return. Perhaps the US economy stumbles while the rest of the world remains strong, the long-awaiting decoupling. 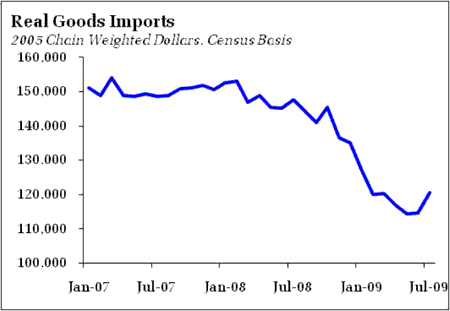 Moreover, the falling Dollar should help support rebalancing, driving export growth in excess of import growth. But perhaps with each new recession the structural nature of global imbalances becomes more entrenched as manufacturing capacity that is lost in the US during recessions is revived overseas, particularly China, thus explaining why durable goods manufacturing employment failed to recover from the 2001 recession and is not likely to recover after this recession. And clearly nondurable goods manufacturing is simply dying in the US, as employment is in virtual free-fall with the advent of the strong Dollar policy. 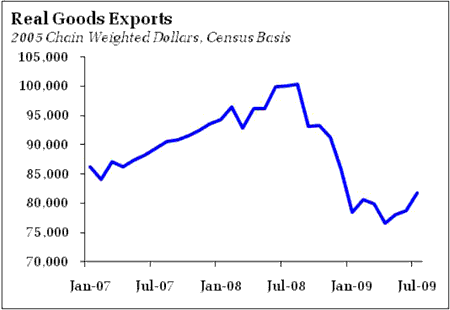 It may simply be that as the US emerges from the recession, sustained rebalancing cannot continue without a very significant depreciation of the Dollar that justifies the more rapid expansion of export and import-competing industries in the US, a depreciation that appears in excess of what Chinese policymakers are willing to tolerate (or other nations are willing to tolerate on their behalf). Or a more significant relative compression of US consumer spending than US policymakers are willing to endure. And, of course, if rebalancing does not resume while labor markets remain anemic, expect trade tensions with China to continue to rise. Never a dull moment on the international policy front.